Flash was banned by Apple on iOS! The official explanations include: 1) Flash is not open (same as iOS); 2). There are better alternatives; 3). Reliability, security and performance issues; 4).Battery life issues; 5).Flash is not for touch screen; 6). Flash is a cross platform development tool. Actually, the last one is what Apple fears. Of course, Flash is not as crappy as what Apple painted. A lot of websites are still using this “old” or “PC Era” technology. There are still sizable (although probably decling after it is banned by Apple) developers So, Flash support has been part of feature list for most Android devices. However, Adobe decided to pull the plug. The Flash player app was withdrawn from Play Store. The official support for Android was stopped at Android 4.0 (aka Ice Cream Sandwich). In fact, Adobe is still maintaining the apk on their website. And Flash still plays nicely with Jelly Bean 4.1 and 4.2. Some vendors (for example, HTC) actually pre-install Flash on their handsets. So, the Flash problem in Galaxy S4 was simply created by Samsung. It has nothing to do with Flash or Jelly Bean. As mentioned, the solution is to install Flash player AND install a third-party browser. Here are the steps. Make sure your Android device is connected to the Internet. Tap the link to download the Flash Player installer. Download begins automatically. When download completes, close the browser. When installation is finished, tap Done. As mentioned, neither Chrome nor the stock browser (aka internet app) does not work with Flash on your S4. Not all third-part browsers work with Flash on Jelly Bean. Here are a few we tested. yYou do not need to have them all, but it is better to test different browsers for the Flash site you are going to visit. Some browsers work great for some sites, but not other sites. Firefox. To be frank, Firefox for Android is not a great app. It is a bit buggy on Jelly Bean. But it is a reliable browser for most sites. Please note, after installing Flash, you need restart Firefox (in the Task Manager, stop it; then start it again). Boat Browser (free). It simply works. By default, the Flash plugin is disabled. You need tap the menu button, go to settings–Page content settings-Enable flash/plug-ins, and set it as always on. UC Browser. It should work without any additional settings. The Flash will not play automatically, and you need touch the play button on each Flash video. After updating your Galaxy S4 to KitKat, the official Flash APK file mentioned in part 1 will NOT work. A xda-developers.com member, surviveland, slightly hacked the official APK file to make it work with KitKat 4.4. You may follow this link to download the Flash Player APK file for KitKat. If that link does not work, you may try this link for the hacked Flash Player 11.1 for KitKat ( credit to surviveland. We are NOT responsible for the APK file. Use at your own risk). After installing the unofficial Flash Player APK, Flash player should work on S4 now. The recommended browser for KitKat is Dolphin Browser. This one works best with Flash on S4. Do you still have problems to use Flash on your S4? Do you have any suggestions? Post them in the comment box below. could you please tell me how to go to page setting content in samsung s4? Do you mean page content settings in Boat Browser? After installing Flash, open Boat Browser, tap the menu button (of your phone), then go to settings, go to Page content settings. Surprisingly after doing exactly as mentioned, the adobe flash test page still doesn’t show the flash content. What could be the reason? Did you try to re-start the browser, especially for Firefox? You can use task manager to clear memory, then start the browser again. Alternatively, you can reboot the phone to see whether it helps. Still can’t use hulu on my S4. It says it still not supported. Can you see the animation in the Adobe’s testing page (http://helpx.adobe.com/flash-player/kb/find-version-flash-player.html) ? Hi its ok now after restarting my phone. Using firefox beta to watch online. Thanks! Glad to know it works. Actually, you just need restart Firefox. I installed the flash player from adobe archives and it still doesn’t work on my s4 . do I guess we are s.o.l. Until next time . Did you try the test page? Can you find the “Flash Player Settings” in the app drawer? You may also try Firefox or UC Browser. Followed instructions and tried various browsers. Most crash whilst trying to connect. Firefox Beta gets as far as an initial screen with the note “buffering” and then crashes…… No joy really. everything worked fine but I cant play facebook games like Marvel Avengers Alliance on my S4..
but my S3 can do the job though.. 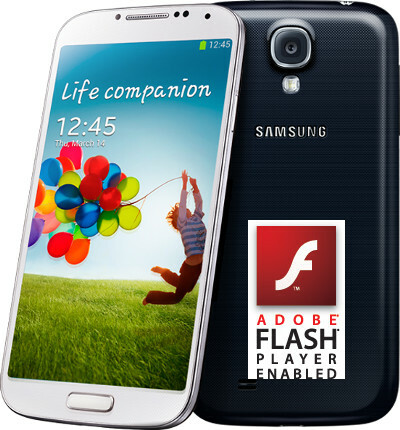 If flash does not respond in samsung s4 try using agent in content setting as desktop. It’s working. After I downloaded the Flash Player, I went to my notifications and clicked ”install”. Then I clicked ”done”, I set setting on boat browser, but something black and green came up, these steps did not help, is there any chance I can do it from my laptop and just put it inside the Samsung galaxy 4 by using a USB? You probably cannot od much from your laptop, except downloading an transferring file. Did you try Firefox, or UC browser? The url is not available anymore on my S4. I get an error page on Adobe. I am not even able to get to the link to download the flash player. I am using Firefox as my browser. didn’t work on my rogers galaxy s4 I give up. Tried this on both my gs4 (4.2.2) and galaxy note 8.0 (4.1.2) — the file downloads but both devices say “cannot open file” thoughts? can you find the apk file in the download folder using any file explorer (e.g., ES file explorer)? No apk file, just a file called “playerglobal11_1swc”. Fantastic!! Worked great- downloaded Firefox beta and now have flash!! Thank you! No sound when playing videos on Samsung Note II any suggestions? This steps may let me able to play games on my s4 such as Criminal Case and Farmville? In this case, wich browser should be better? Makes any difference Flash Player saved on SD card or on the telephone? what about on default browser? No, it does not support Flash at all. Rebooted after following instructions to the letter, can’t see the test movie. I will not work! I hate this phone!!!!!!!! Did you try firefox, or any other browsers mentioned? I am trying to play My Vegas (facebook app) on my galaxy s4. I downloaded flash and boat browser. I changed settings to enable flash (always on) and user agent to Desktop. I am still being told that the latest version of flash player is required to play the game. I have seen other people saying they can play. What do I do? As I know, this app does not work on Android. They planned to released an Android app, but no news. Glad to know it works finally. hi, since i got my phone i have been able to stream gorillavid through my video player but it stopped working a few days ago. should i download a flash player to see if that works or has my phone done some kind of auto update that has blocked it. its coming up format may not be supported etc. Works perfectly on my Galaxy S4 with Boat Browser. No bugs so far. doesnt work with opera mini…I want to play top eleven..any browser u guys can recommend to me. Try Firefox as mentioned in the post. Thanks for a great article and very helpful for someone who is new to all this. Although Boat isn’t working out for me so far, I’m going to try Firefox or Puffin. Chrome for Android never support Flash. The stock browser (internet) in S4 does not support Flash either. You can try Firefox or UC browser after installing Flash. Nope…not working at all,can’t even install. “Apps does not install”…. Once downloading is successful, tap the notification message for the download. You will then have the option to install. Please note, you need enable apps from unknown sources before tapping the message. I download the file but when I try to install I get a message that says “app not installed.” My phone says I already have flash 11.1 so I don’t understand why it won’t work. You should uninstall it first, then install the modified one if your S4 was updated to KitKat 4.4.2. I tried to install and open it says cannot open file. Do you know why this would happen?